I'm not responsible for this particular photo, but it was taken this past February after the second of two anniversary shows by Killing Joke at the Shepherd's Bush Empire in London. The two gents on my right are insane Frenchmen and fellow members of The Gathering. 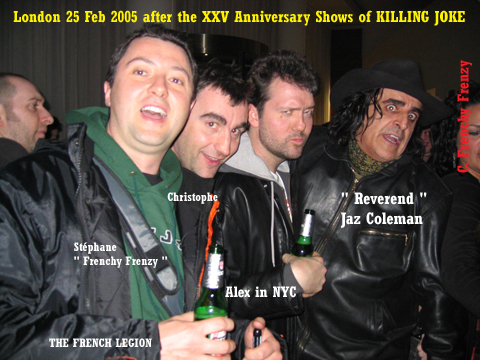 The man to my left is the one and only Jaz Coleman of Killing Joke, who was good enough to pose with us....as we are clearly in a state of "advanced refreshment".